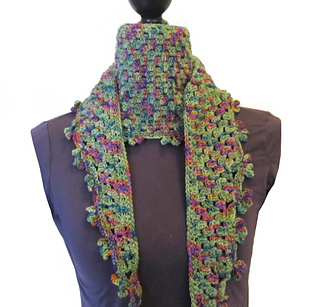 Show off gorgeous variegated yarn with a vivacious scarf that will bring joy to any outfit. Style it as scarf, wear it around your hips as a belt, or channel your inner flower child when you don it as a hair kerchief. Lea in Bloom starts with a unique crocheted edging featuring petal stitches. The shaping comes to life as the interior of the scarf in worked in ever-growing rows.